Working with my students to create podcasts about American art history was an eye-opening experience. The most rewarding parts of this project for me as the instructor were the ongoing conversations that I had with students throughout the quarter and the opportunity to witness them develop a mastery of their material. They consistently surprised me with their creative approach toward their subjects and their drive to convey their passion for their topics for a public audience. In Spring 2016, I taught HAVC 46: Intro to U.S. Art and Visual Culture with the support of a Chancellor’s Graduate Teaching Fellowship. Serving the fellowship's mission to foster pedagogical innovation, I involved my students in a quarter-long project for the creation of podcasts. The inspiration for this assignment came from a desire to support undergrads in creating work that could help a general audience to see the intersections between art history and everyday life. I also wanted students to comprehend not only how art and visual culture help us understand historical issues better, but also that there are real historical and social implications tied to questions of representation. With these objectives in mind, students were asked to partner with a classmate in order to create a podcast where they analyzed two pieces of art or visual culture in order to comment on an issue in American history. In essence, the assignment asked students to develop their capacity to look closely at a work and derive meaning from its visual qualities. This is a skill that is foundational to art history: in shaping the podcasting assignment around it, I wanted all of the students, regardless of their major, to understand that reading images is an important skill in a world that relies heavily on visual forms of communication. By relaying this information in a podcast, my students would have the opportunity to translate their analyses (supported by research) into a format that wasn’t bound by the conventions of academic writing. The most exciting element of this assignment was that students were given the freedom to select their artworks and topics. Since the podcast project was an experiment, I was asking my students for their trust in my ability to guide the class throughout each stage, from proposal to first draft and from revision to final recording. In turn, it only felt fair to reciprocate that trust by demonstrating confidence in their ability to develop thoughtful project topics and by offering them support, feedback, and guidance at multiple intervals. This course offers an introduction to American art and visual culture—including architecture, painting, photography, sculpture, advertising, and performance art—from the nineteenth- through the twenty-first century. More than simply offering a survey of stylistic changes over time, the class will explore the social and political meanings of art. Students will acquire the tools necessary to analyze what art reveals about the nation’s values and beliefs. While offering students exposure to a range of issues that are of critical concern to American society, the course will pay particular attention to questions surrounding gender and race. Image caption: Faith Wilding. 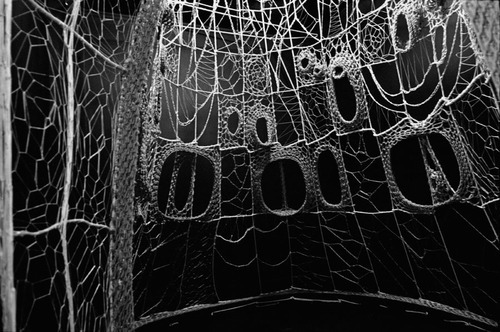 Crocheted Environment.Mixed media installation. 1972.